A Life Full of Holes: The Strait Project: Factory 1, 1998. Thousands of Africans have drowned crossing the narrow but treacherous Strait of Gibraltar, which divides Spain and Morocco, since the 1995 implementation of the Schengen Agreement closed Europe’s external borders. Yto Barrada’s photographs subtly examine the psychological and symbolic weight of this unilateral verdict on everyday life in the artist’s hometown of Tangier. 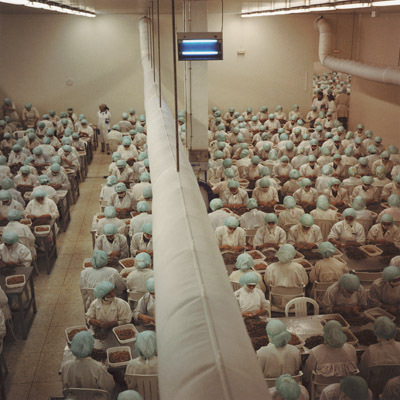 Ennui is palpable, such as in a factory scene where rows of workers in surgical masks and green caps peel Dutch prawns for shipment back to the Netherlands. Tangier’s fabled hill of Antaeus, where Hercules felled his giant, is ringed by creeping urban development. Close-ups of bus logos look like Malevich canvases, but to smugglers in the know they signal destinations, schedules, and the body capacity hidden in the holds. Barrada’s series includes reproduced photographs, such as an aerial image of the Strait known throughout Tangier. The two continents stretch towards each other, dramatically revealing their ten-mile proximity. The artist’s two videos, The Magician, 2003, and The Smuggler, 2006, continue her investigation, albeit obliquely. Smoking a cigarette and tapping on a rickety table, the magician Abdelouahid El Hamri, aka Sinbad of the Strait, produces Ping-Pong balls from his mouth and puts a chicken to sleep on its back. For her first solo exhibition in the US, Barrada succeeds in elucidating a little-known problem of drastic proportions through a formal mode that operates productively between documentary and conceptual, allegory and lived reality.